Set within the beautiful complex of Charleton Court Barns is a very special property, Middle Barn. 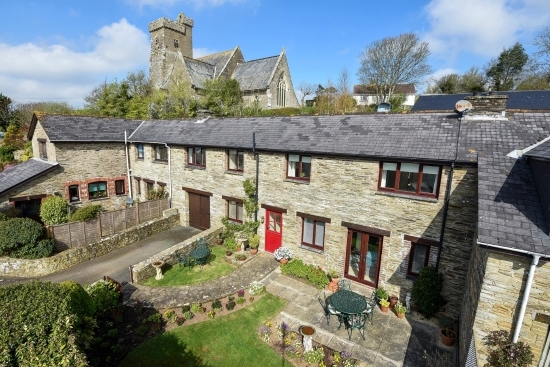 It offers well laid out accommodation over 2 floors, sitting just below the Parish Church in a peaceful and tranquil location. On entering Middle Barn you are immediately struck by the immaculate presentation of the property which has been lovingly maintained by the current owners. All 3 bedrooms are very good sizes, with the master having a stunning view down to the yachts in the Salcombe estuary. There is a light and spacious sitting room with dining area to one end, offering an open fireplace and French doors onto the sunny garden. There is a well-appointed kitchen with plenty of space for a kitchen table. Internal access is through the kitchen into the integral garage, having a utility arrangement as well as plenty of space for a car and storage. The property has a lovingly tended sunny south facing front garden, offering a good degree of privacy, perfect for al fresco dining at any time of the day. Middle Barn has driveway parking and an additional allocated parking space, with separate visitor parking. Middle Barn is offered for sale at £385,000. For further information, please contact Marchand Petit’s Kingsbridge office on 01548 857588.